UNITED STATES—Summer is amongst us, and for many those vacations are in full-force. There are many typical destinations that many flock to during the heat of the summer months, none more popular than Las Vegas. Yep, sin city is a place that is unlike any other. For starters, that entire myth that the destination is not a place for kids, doesn’t quite hold true. My first foray to the gambling capital had me in shock to see how many people brought their youngsters to a city that is not as kid friendly, as many would like to think. Vegas in my opinion has lots of things that many would be shocked to discover, it’s not a place for kids, especially at night. Transportation to get around Vegas is tricky. Is having a vehicle a good thing? It depends on rather you like to be stuck in track for long periods of time. It’s better to rely of taxi-cabs, public transportation and the monorail that connects visitors to the entire strip. Speaking of the strip, it’s much longer than it appears to be; like the tune of about 5 miles. Walking the distance could take quite the energy from one, especially during the hot summer days, but I will admit I easily lost about 15 pounds the entire time I was in Vegas from all the walking I did. Best time to get a great walk or jog is during the early morning hours between 5:30 a.m. and 8:00 a.m. 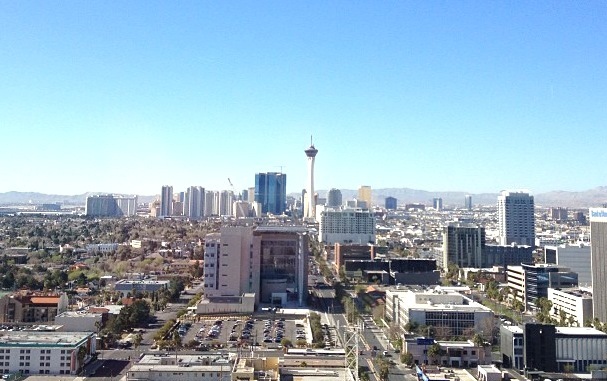 The strip is not necessarily empty, but many of the partygoers are checking out for the day during these time frames, which makes it easy for one to navigate themselves along the strip and to explore. Walking the strip between the hours of 11 a.m. and 11 p.m. is utter chaos in my opinion. The crowds are beyond manageable to walk through, hence my reasoning why it isn’t wise to bring kids to Vegas. God forbid a child got lost; it would be a nightmare to try to locate them. Vegas is not a place where one would like to spend more than three days in my opinion, after that the city becomes a place where the repetition makes heading home seem like a treat. You can only gamble so much, before you get tired of doing it. I mean EVERY casino is loaded with slot machines at the possibility to win big or to lose big. Note: If you truly plan to gamble, hitting downtown Vegas might be your best bet, you have a much better chance of hitting big there than any of the other casinos based on my experience. The ambiance of the city is what I enjoyed so much while there. Each casino has architecture that will amaze you, from New York, New York, to Excalibur, to Caesars Palace, you will be left breathless. For those who love to shop, there is plenty of that to do in Vegas as well, the shopping is unlimited. Take a stroll through the shops at Caesars Palace and it will leave the most avid shopper breathless. You name it, they’ve got it. The great thing about Vegas is the options of entertainment, from magic shows to musical performances, and plenty of nightlife, there is tons to do beyond gamble. The one thing that may surprise people about the city of Las Vegas is the food options, as there are plenty. A place that must be visited in my opinion is a burger joint inside New York, New York. It is unlike any place I’ve ever been to. I had a salmon burger that knocked the socks off of me. Literally the best thing I ever had. Forget about those five-star restaurants and the buffets that so many people frequent to. There are many small, quaint restaurants that are the perfect treat for those foodies out there looking for something unique. Las Vegas is the perfect vacation for summer. Leave the kids at home, explore your options and consider cutting the vacation from a typical week to three maybe four days max. Trust me anything longer than four days and you’ll be reading to get on that flight and head back home.